This letter turns out to be the penultimate installment in my now five-part series on tax reform. Part one was an introduction and a discussion of some of the problems of the proposed border adjustment tax. Part two went further into the proposed reforms and reasons for them, focusing mainly on what I liked in the proposal. Part three was a determined evisceration of the border adjustment tax proposal (which I think potentially has all sorts of negative consequences, up to and including starting a global recession). You can read parts one, two, and three by clicking on the links. I also sent as an Outside the Box this past Wednesday, written by Constance Hunter of KPMG, who analyzed the proposed reforms, discussing the difficulties of the proposed border tax as well as other issues. I hold that it is not fair to criticize a proposal unless you have something else to offer. Next week I will wrap up the letter by telling you what I think we should do – and then offer you the opportunity to create your own tax proposal. This week we’re going to start the letter talking about why tax reform is one of the most urgent decisions facing the body politic today. Tax reform will set the tone and direction of our nation’s economy, not just in terms of taxes but also with regard to jobs and healthcare and indeed the entire fabric of our social contract. I will also hopefully demonstrate that tax reform will not only affect our tax accounting and payments but, far more importantly, it will largely determine the environment in which we earn our incomes and make our investments. It will have huge implications for portfolio and investment returns. As I have said in the previous letters, this proposed tax reform (whatever form it actually takes) will literally touch everything in our lives. It is critical to get it right. Let me hasten to say that if we get it wrong, (or at least in terms what I would call wrong) the world will not come to an end; we will Muddle Through, and most of us will still have enjoyable, productive lives – though many of us will have much different lives. It is the people who are in the lower 75–80% of the economy who will be affected far more than those who are in the Protected Class (also sometimes called the elite), whether they are Republican or Democrat. But as we are seeing from the current political turmoil in the United States, a lack of transparency and a failure to achieve a more even distribution of the benefits of our economy is driving a sense of true fear of the future among the populace. Sometime in March I will begin a series called “Angst in America,” in which we’ll deal with the economic underpinnings of why we live in such contentious times. As we jump in today, let’s start with a little game: On a piece of paper, or at least in a part of your mind where you are habitually honest, write down what you think is the size of the government relative to the size of the private sector in terms of percentage of GDP. We will come back to that exercise in a moment. But first, let’s look at why tax reform is important. Where Will the Jobs Come From? This is a broad generalization, which of course will lead to many objections from readers, but for the majority of Republicans in Congress, this tax reform is mainly about jobs. Yes, there are some Republicans who simply want to “starve the beast” by reducing the size and scope of government or who are philosophically inclined to think that income taxes are too high. And I will admit that those are also secondary impulses in most of the Republicans who are primarily focused on jobs. I should hasten to add that there is a reasonable degree of bipartisan agreement that the corporate tax structure needs to be reformed, as it is obviously putting US companies at a disadvantage. If it were possible to deal with just the corporate tax, rather than having to rework the entire spectrum of taxes, I think it would be possible to pass a reasonable bill quickly. But both sides of the aisle want to deal with corporate taxation as a part of the whole rather than to address just its inequities. So we have had no real corporate tax reform for the last two administrations. By the very nature of the political process, politicians are focused on the very near-term future. Upcoming elections, like hangings, have a way of focusing the mind on the here and now. A significant part of Trump’s campaign centered on the angst of the white middle class and the ongoing loss of jobs in the Rust Belt – and that focus gave him his margin of victory. Trump promised to bring those jobs back, a sentiment that resonated powerfully with the electorate. The problem is that at least 80% of manufacturing jobs were lost not to companies moving factories to China or Mexico but to increased automation. Some estimates run as high as 90%. Those jobs are never “coming back.” They are gone. And that trend is going to continue and accelerate. I fully understand that if we do get corporate tax reform, along with some other reforms, it is quite possible that Apple, for example, would move its iPhone 10 factory to the US. But iPhones are increasingly assembled by robots, and in a few years those and other such products will mostly be made on largely automated production lines, whether in China or the US. That said, if Foxconn does set up a flat-screen display factory in the US, it would create 30,000+ jobs. Of course, they are asking for US government help and subsidies. Note that Apple has 766 suppliers, of which just 69 are in the US. Manufacturing iPhones in the US would be more about the logistics of getting just-in-time components from those other 700 suppliers, which are all over the world. The additional cost for US-based labor would not be all that much. And that situation is playing out over hundreds of industries. Much of what we buy today is absolutely reliant on a complex, seamlessly functioning global supply chain. Did you know that an Apple iPhone contains about 75 elements, as in periodic table elements? There is iron, aluminum, carbon, and silicon, of course, but also a host of exotics. Most of those aren’t mined or refined in the United States. Current or near-term jobs in manufacturing are not the critical issue. We are rapidly entering the Age of Transformation, a period in which change will continue to accelerate until it comes at us blazingly fast. And I’m not talking about just the introduction of new technologies; employment and job creation are also changing extraordinarily quickly. There are 250 million cars and trucks on US roads today. We buy more than 16 million cars a year, replacing the older part of our fleet. In a world of shared automobiles, which automated cars will allow, we won’t require 250 million cars; we will need far fewer. I could see the total numbers being down 50% by 2030. Autonomous cars are going to be adopted amazingly quickly, especially by Gen X and Millennials. And this Boomer will be an early adopter, too. Let’s think of the impact. First of all, there are 3.5 million truck drivers, 75% of whose jobs (at least) will be replaced. Ditto for the 250,000 taxi drivers and 160,000 Uber drivers, not to mention the 100,000 Lyft drivers. Estimates are that automated driving will reduce accidents by 90%. That will obviously reduce insurance costs but will also decimate the ranks of auto insurance agents. Each year 1.3 million people are injured in vehicle accidents, with 40,000 deaths. That’s a lot of hospital visits. Eventually, 90% of those injuries will go away, reducing demand on hospitals and eliminating jobs. We won’t need as many policeman, firemen, and ambulance drivers at accident scenes, either. In total, we could be talking hundreds of thousands of jobs. And then there are the auto repair companies that make a living off fixing damaged vehicles. There are 500,000 auto repair shops. Obviously, they do more than just repair wrecked cars, but today’s cars and trucks are lasting longer and need fewer repairs. And we are moving to electric vehicles, which have relatively few moving parts, so repairs are becoming much simplified. There are numerous benefits to autonomous driving, but an increase in total employment is not one of them. Automated driving will create jobs, just not as many as it destroys. The total job loss just in the United States might approach 10 million. These jobs are not going to disappear in year one, but from the point of view of somebody working – and then suddenly not working – in an affected industry, the change will seem like it hit overnight. And that is just one industry and one technology. 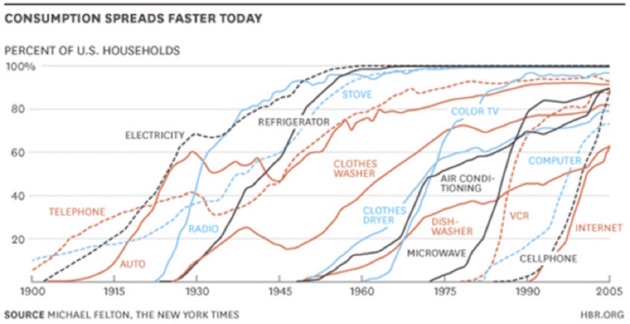 Maybe it’s one of the bigger, more dramatic examples, but there are literally hundreds of new technologies that are going to eat up jobs faster than they create them. There are literally tens of millions of jobs in just the US alone that will probably vanish over the next 20 to 30 years. 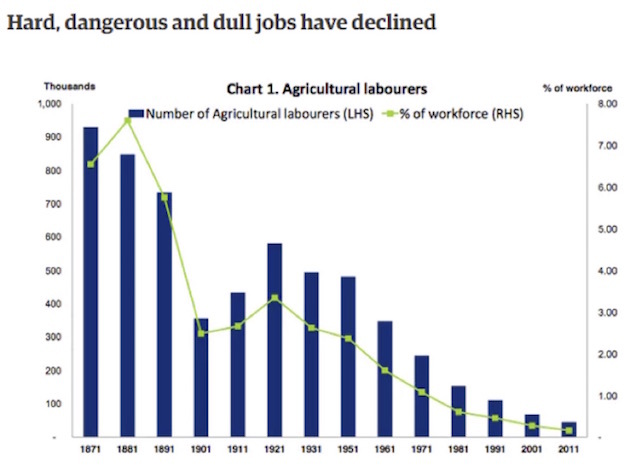 Of course, we have to remember that many jobs have disappeared with the introduction of new technologies every decade for the last 200 years, so this is not exactly something new. The difference is that now it’s happening much, much faster. Rather than moving from the farm to the factory to the office over 10 generations, we will be creating, destroying, and remaking whole industries in half a generation, making the always bumpy transition to a new workforce that much more difficult. And of course, we need to remember that many new technologies and social inventions will create whole new categories of workers and job opportunities. The road ahead will hardly be a one-way street: all job destruction and no job creation. As we will see, making sure that we create more jobs than we lose is at the heart of tax reform. I promise you, there is a deep, direct connection between tax reform, the creation of new businesses, and employment rates. The huge generation of Boomers will be retiring and dropping out of the work pool, but absent new job creation, the unemployment rate is going to rise significantly. We are going to get back to job creation in a bit, but first let’s look at a quick snapshot of where we are today. 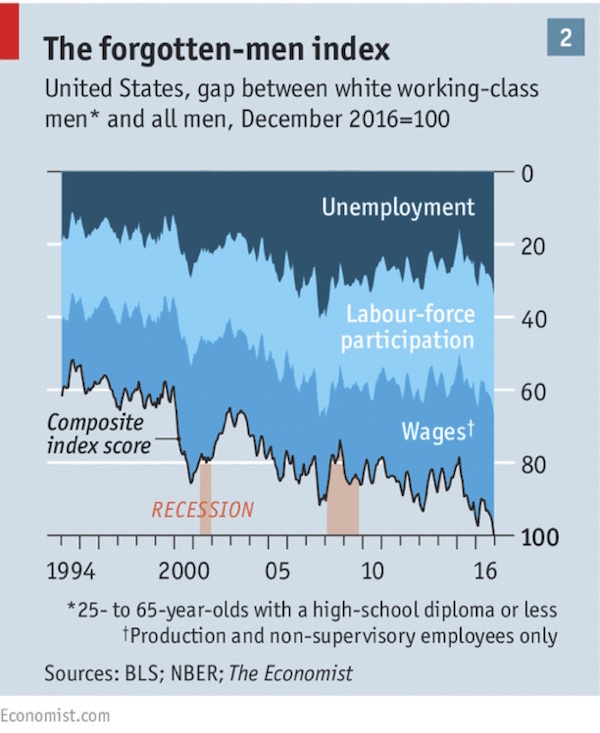 The Economist has created something called a Forgotten Men Index, which shows the gap between white working-class men in particular and all men in general. I bring this data up because white working-class men have become the focus of much current political discussion. The participation numbers are similar or worse for other racial categories except for Asians. Among the 10 million men not in the workforce – men who are not even looking for a job – 57% of the Caucasian population between 21 and 55 collect disability benefits, which means they can get Medicaid benefits and cheap narcotics: Opioid addiction has become rampant in 50-something men. For the first time in the last 250 years of history, we are watching the probable longevity rates within a demographic segment of the population fall. That specific demographic is working men in their 50s, and the main causes of early death in this cohort are alcohol, drug abuse, and suicide. Shrinking workforce participation is not a recent trend. It has been happening since the ’60s, through every administration and every tax reform. It seems that with every major technological advance, a certain portion of the working population doesn’t find a way forward to take advantage of the next set of opportunities. Let me pull a few random quotes from Nicholas Eberstadt’s powerful book Men Without Work. These are just a few of the almost 40 pages that I copied and made notes on from his 200-page book. I could literally write a whole letter just focusing on what I think are important quotes. The work rate has improved since 2014, but it would be unwise to exaggerate that turnaround. As of early 2016, our adult work rate was still at its lowest level in three decades. If our nation’s work rate today were back to its start-of-the-century highs, approximately 10 million more Americans would currently have paying jobs. Here, then, is the underlying contradiction of economic life in America’s second Gilded Age: A period of what might at best be described as indifferent economic growth has somehow produced markedly more wealth for its wealth-holders and markedly less work for its workers. This paradox may help explain a number of otherwise perplexing features of our time, such as the steep drop in popular satisfaction with the direction of the country, the increasing attraction of extremist voices in electoral politics, and why overwhelming majorities continue to tell public opinion pollsters, year after year, that our ever-richer America is still stuck in a recession…. Between 1948 and 2015, the work rate for U.S. men twenty and older fell from 85.8 percent to 68.2 percent. Thus the proportion of American men twenty and older without paid work more than doubled, from 14 percent to almost 32 percent. Granted, the work rate for adult men in 2015 was over a percentage point higher than 2010 (its all-time low). But purportedly “near full employment” conditions notwithstanding, the work rate for the twenty-plus male was more than a fifth lower in 2015 than in 1948. We will look at Eberhardt’s stats in greater depth in my upcoming series on angst in America. But recent data over the last number of years have begun to show that it is not just the American male who is struggling. The participation rate of female workers is beginning to decline as well. The trend in the workplace has not been our friend. And any reasonable analysis suggests that in the future the rate at which jobs are being lost to new technologies is only going to double and triple. This is one of the central problems facing society today, not just in the US but all across the developed world. Do you think the trends will be any different in Europe, England, Japan, or China? Those countries will all have their own ways of dealing with this problem, of course; but technology is going to put a strain on the number of jobs available to people without specific technical expertise. And while we would all agree that paramedics require a great deal of technical training, if we need fewer of them because there are fewer accidents (which is a good thing), the paramedic field is just one of 100 different job categories that will feel pressure as technological change transforms the future. Now here’s where I throw in the plot twist. The research shows that technology has net-net created far more jobs than it has destroyed. You can see this outcome in a wide variety of research over the years, but a recent study by Deloitte (as reported in the Guardian), which drew on data going back to 1871 in England and Wales, found that technology has been a job-creating machine. Part of that is because technology increases people’s spending power, which creates a surge in the demand for hairdressers, bar staff, etc. Going back over past jobs figures paints a more balanced picture, say authors Ian Stewart, Debapratim De and Alex Cole. “The dominant trend is of contracting employment in agriculture and manufacturing being more than offset by rapid growth in the caring, creative, technology and business services sectors,” they write. Do we regret all the people who lost jobs from doing our laundry? Washing our restaurant dishes? Shoveling horse droppings from the street? Oh, you might miss your bank teller, but then you never go to see her/him anymore, do you? Some of us of a certain age remember the milkman who would bring us fresh milk (in recyclable glass bottles). He came at least every other morning. And then there was the ice company that would deliver ice to put in your “icebox,” which would keep food “cool,” on an uneven basis, which was better than simply leaving it to sit on the counter and gather bacteria and mold. Younger readers may have to click on the link to understand what a marvelous new technology an icebox was, starting in the mid-1800s. Seriously, cutting-edge, life-changing technology. And somebody had to deliver that ice every day. Big heavy blocks of ice. Over and over again. The same route every day. Running the local ice company was a very profitable business. Some 81% of New York inhabitants in the early 1900s had an icebox. (The figure was much lower in the rural South.) But the iceman was a completely different person from the milkman, and they both had to have someone take care of the horses that drew their carts until early in the 20th century, when those remarkable new things called trucks were invented. And now all those jobs are gone. So now I am here to tell you that technology is not the problem. Technology is the solution. Well, actually I agree it’s the problem if it’s your job. But the solution is to figure out how to get in front of the technology curve or figure out who is in front of it and get involved with them. 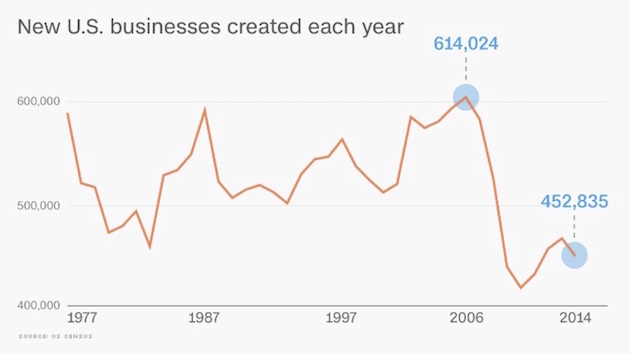 Because, at the end of the day, the data shows that net-net, new job creation comes from small business startups. That is, all of the net new job creation comes from small businesses less than five years old. Well, hooray! We are still creating 450,000 new businesses a year. Well, except. Except that we are losing more enterprises every year than we are creating. And we have been since the beginning of the Great Recession. Part of the problem, as Tyler Cowen describes in his new book, The Complacent Class, is that Americans have seemingly lost some of their entrepreneurial drive. In the 1980s new startups accounted for some 12–13% of all businesses. Today it’s 7–8%. If we want to create an economy that is a jobs machine, we are going to have to have more business startups. Which means that we have to create a climate in which people feel comfortable in launching risky new ventures. Large enterprises – those that have more than 500 employees and are more than 10 years old – are net-net destroyers of jobs. For every Google or Apple that is growing its total number of higher-paying jobs, there is a Buggy Whip Corporation or Icebox Corporation that once dominated its industry but is now either defunct or shedding jobs in an effort to stay viable – or else scrambling to change its model and product delivery entirely. This is what Schumpeter called creative destruction, but it is more sympathetically called creative competition. And let’s remember, Google and Apple were once small business startups that for whatever reason (perhaps the genius of their founders) became big and dominant. Anyway, K & E was offered this new technology called the electronic calculator back in the ’60s, when it could perform only your basic four arithmetic functions, yet the device cost $250. They turned it down, their reasoning being, “Who would want to buy something that can only do a few calculations for $250 when our slide rules can do so much more for a fraction of the cost?” Seriously, we put a man on the moon with K & E slide rules. The company filed for bankruptcy in 1982. Blockbuster? Kodak? Very small startups took them both out. And with them an enormous number of jobs. The future is not in old companies that are just getting by or fading. The jobs of the future are in new companies that have yet to be dreamed up. But they will all have to be found and financed. This is actually one of the more optimistic charts. You don’t need many companies to end up on the far right-hand side of this graph in order to show a decent overall return on investment (ROI). But remember, these are venture capital professionals. When you sit with them, they will tell you that they turn down multiple scores of “opportunities” for every one they jump on. They are supposed to be good at this. And yet two-thirds of their investments lose money. 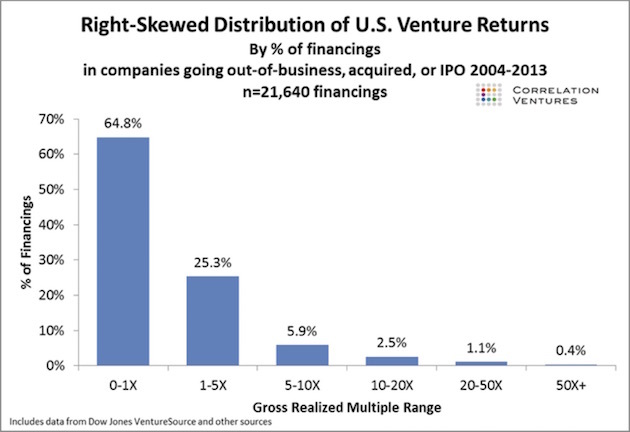 And even with that seemingly dismal track record, people line up to give the best VC firms still more money. Actually, I wish I were big enough to get into that business. A shot at being in on the very beginning of the next Google or Facebook? Priceless. I have my own checkered past with startups, both my own and others I have helped to finance. Some have been successes; some could be best characterized as tax write-offs; and still others chalked up to “What were you thinking?” moments. That is the nature of entrepreneurship and new-business investing. If you have the entrepreneurial bug in your gene set, you know what I’m talking about. If you don’t, you may have more money than I do because you have saved yours and not lost it on silly ventures – but you just don’t get it. I have good friends, like Reid Walker, who like to go to Vegas and gamble. I think they are foolish. Wasting money. Can’t they see the odds? And yet I will go and back yet another new venture (my own or others’), even though I know the odds of its success are much worse than I could get in Vegas. But seriously, I tell myself, this one is different. I can feel it. Just look at the hypothetical performance I calculated. Those potential returns are so sweet. So alluring. I can hit that inside straight. Luck’s going to be a lady tonight. And every one of those new ventures and the half a million new businesses started every year requires capital. Every $%^&$&^% one of them. Blood and sweat and tears and lots of money. And that money has to come from somewhere. There are many politicians who think there is a new-jobs fairy. Just give the government more money, and it can create a “jobs program” that will create those new jobs. Okay, now I’m going to be the guy who told your kids there is no Santa Claus. There is no jobs fairy. Just call me Mr. Grinch. All there is, seriously, is a dream factory where some person wakes up and decides they can create a brand-new future that leads to a better world and coincidentally some income for them. Or maybe the desire for income comes first. But then they have to figure out where to get the startup money. Business plans. Credit cards. Family and friends. If you’re connected and in Silicon Valley, maybe an introduction to Kleiner Perkins. And you’d better be damn good if you want to be one of the 5% they choose to back. Most new businesses are more mundane than high-tech. Hairdressers, bars and restaurants, dry cleaners, and tons of franchise companies. Seriously, franchises are real businesses. For example, 82% of McDonald’s are owned by franchisees. They make between $500,000 and $1 million in profits per year. Various franchises account for over 8% of US jobs. All of the top 50 franchises are rather mundane local businesses – doughnut shops and hair salons and commercial cleaning outfits. Not exactly high-tech but solid jobs nonetheless. Seriously – go to Entrepreneur magazine’s Top 500 Franchise List if you have nothing else to do. Find me a high-tech, cutting-edge startup on the list that is going to be the next Google or Apple. But are these real businesses? Yes. Long-term moneymaking opportunities? Maybe. But costly to start up? Absolutely. The new businesses that are going to create the real jobs we need to thrive in the 21st century are still in the dream and garage stages. They’re going to need capital. And they’re going to need people who think they can get a return on their money when they invest, whether they’re putting up their own money or persuading someone else to come in with them. What we are going to confront next week – and this is the answer to my question at the beginning of the letter – is that total US government spending – federal, state, and local – is more than 35% of the US economy, not including the increase in the national debt every year. Private business is less than twice the size of government and has to support all those government expenses. Yes, I know that some of that support is circular since government employees pay taxes, but their taxes don’t increase the size of the pie. Now, some of you will argue that 35% is less than the 50% or so in many European countries, but that is not the point. Every dollar of income that goes into paying taxes and supporting the government is a dollar that can’t be invested in a new business and thus create new jobs. I get that that is a simplistic statement. Some people’s savings are simply their savings that they never invest in any new enterprise. And then there are people with my genetic defect who have the entrepreneurial bug and can’t help themselves. They take all their savings and new profits and plow them back into new ventures (rather than going to Vegas). But on average, the data clearly shows that the more capital there is in a country, the more entrepreneurial capacity there is. And if you tax that capital too heavily, then you’re going to have less entrepreneurial activity. That is substantiated across countries and time in all of the research. Seriously, show me research that demonstrates that higher-tax countries have more entrepreneurship and business creation than lower-tax countries do. I double dog dare you to come up with something that is not data-manipulated (or from a very small sample) that can even come close to demonstrating that entrepreneurship is not related to available capital. I triple dog dare you. There is a simple reason that the United States has been an entrepreneurial hub: We have traditionally taxed less than other countries. You can come up with other reasons, other cultural factors, and other explanations; but as an entrepreneur and a businessman and an economist, looking at all the literature, for me it really does boil down to availability of capital. And have you been watching the explosion of new businesses in China as capital becomes available? Please don’t give me this mumbo-jumbo BS about Federal Reserve interest rates and job growth. If you are starting a business, interest rates make damn little difference. You can’t borrow money from traditional sources anyway, except on your credit cards, which probably carry high interest rates. And maybe you can induce friends and a few other people to take less interest than that on their loans to you, which you have to guarantee. The businesses that are helped by lower interest rates are larger businesses that already have access to the credit window at their banks. But all the research – and I mean ALL the research – shows that large businesses are net destroyers of jobs. So maybe lower interest rates help them destroy fewer jobs, but low rates are not helping them create new jobs. According to my friends who are talking to people in the Trump administration and my contacts in the Republican Party leadership, the new administration truly gets that job creation is its most important product. From what I hear, Steve Bannon is extraordinarily focused on creating new jobs. And the Republican leadership understands that cutting taxes and putting more money into the hands of potential entrepreneurs is the way to create jobs. You can call that trickle-down if you want to; but I swear, when I was starting out in my 20s, trying to scrape together every penny (literally), driving 20-year-old cars and kiting checks to start my first business, I didn’t feel like there was anything trickle-down about my efforts. There wasn’t anywhere down from where I was. There is a reason that some of the fabled startups were born in parents’ garages. That was the only place those young upstarts could afford! And every penny they made got plowed back into the business, over and over again. It wasn’t until much later in the business cycle that they began to live like rock stars. At the beginning, they were just like me. They would wake up at 2 AM and their stomachs would be in knots because they didn’t know where they were going to get the money to pay their employees or the electric bill or to give their wives enough money for food for the kids. Somebody had to actually pay them for their hard work or their great new product so they could turn around and pay what they owed to everyone else. So they got up the next morning, very early, and hit the ground running, believing they could make it happen. That’s an entrepreneur. And when you tax them and regulate them and create all sorts of obstacles, you don’t get the new jobs they can create. That’s just a fact, Jack. You can live in your %*&^%*&^ ivory towers and point to data flows, and they don’t mean a thing because the data can tell you whatever you want it to tell you. The reality is, it all happens down on the front lines, where entrepreneurs wake up every morning trying to figure out how to make their businesses bigger, better, badder, meaner, leaner, faster. And they try to motivate their (often few) employees to sign on to the vision, for a paycheck – and, in a few cases, a piece of the future. And that, right down on the bottom line, is why tax reform is so important. I can disagree with Chairman Brady and Speaker Ryan over the specifics of their tax plan, but I wholeheartedly and enthusiastically endorse their vision that we have to let entrepreneurs keep more of their earnings so they can put them back into growing their businesses. (And at the same time, we can’t blow out the budget deficit.) I am Chairman Brady’s biggest cheerleader! Just not so much on one not-so-small tax-reform detail. And note that if the businesses don’t reinvest and change, they die. You are either in the business of living, or you’re the business of dying. Businesses that live are taking the capital that they make and putting it back into growing their businesses. Give them less capital, and they grow less. That is manifestly true across time and nations. Now, what I’ve outlined above says absolutely nothing about how the government should be involved in what we as a collective national social enterprise are doing to more graciously extend the benefits of a changing and improving culture to all of our citizens. Two entirely different topics. I get that we need to more evenly distribute the benefits of future growth. I also understand how those future benefits will be created. And therein lies a chicken-and-egg problem. It all comes back to Keynes versus Hayek, as does damned near everything economic and governmental. Is it demand, or is it income? Which is primary? The questions about the role of government, and all of the questions I have posed, come down to that root conundrum. So that is why this tax-reform process is so important. The longer we wait to build the entrepreneurial foundation for creating the future and the jobs of the future, the less certain and the more frustrating our future will be. We have an opportunity to do something big this year. As in really BIG. Or we can do nothing. Or do something that will only kick the can further down the road. And if we do that, how do you think the market, which is expecting a big tax-reform bill to come through, will react? The Trump bull market will quickly morph into the Trump bear market. Which do you think will be remembered? Seriously. Next week we will look at why tax reform is so hard. When you actually look at the numbers, it is enormously complex, and nothing is easy. The Republican leadership in Congress has an extraordinarily difficult job to do to actually come up with a tax plan that can pass both the House and the Senate and that will actually make a difference. Anybody can pass a tax plan that won’t make a difference and call it “tax reform.” We have a once-in-a-lifetime opportunity to really change things. In the words of Barry Switzer, one of the greatest football coaches of all time, “There’s only one most important thing. Don’t fumble the @%#$@# ball.” In 2017, the Republicans have the ball. Here’s hoping they don’t fumble it. I will be in New Jersey March 14 and 15. I will be speaking at Summit, Red Bank, and Hackensack, New Jersey, in the two evenings and a lunch. This event is free and is sponsored by my friend Josh Jalinski, who is known as “The Financial Quarterback” on weekend morning radio, which he dominates in the New York/New Jersey area. My good friend Steve Blumenthal will also be doing part of the presentation. The events are already close to capacity; but if you would like to come, drop an email to Tina@jalinski.com and she will get the time and specifics back to you. This is for individual investors – I look forward to seeing you. As part of the launch of my new portfolio management company, I will be hosting regular dinners at my home for independent brokers and advisers, where we will share with you the specifics of how we are going about changing the way you manage the core of your portfolio. As I keep saying, the key is to diversify trading strategies, not just asset classes. Technology has allowed us to do some marvelous new things, and portfolio diversification in order to smooth out the ride is one of them. One of my goals is to be able to help brokers and advisers get their clients through the storms that we all know are coming as the world struggles to figure out how to deal with the massive amounts of debt and government obligations that are building up. Maybe not this year, but at some point there has to be a great reset, and you need to be able to get your clients through it. If you would be interested in attending to learn more about what we’re doing, drop a note to me at business@mauldinsolutions.com. Give me your name and what firm you are with. We’ll get back to you ASAP. We will start holding the first of my chili dinners late in March and then on a regular basis here in Dallas. Last night the Mavericks gave Shane and me a game ball during halftime, recognizing the fact that I’ve been a season ticket holder for 32 years. I’ve seen some great basketball and some pretty ugly basketball in those times, but the NBA is still the most beautiful of all sports. There’s just something about the fluid power and grace of the athletes as they fly through the air doing things that we mere mortals can’t (?) do. It’s nice if your team can win an NBA championship, and I’ve seen some of those – and other times we were just oh so close. Then there are the times when it’s just best to throw in the towel and go young and get some draft choices. I’ve lived through it all and expect to be watching 32 years from now. And the players will be bigger, better, faster. Somehow. I’ve come a long way in those 32 years. My first tickets were literally in the corner on the back row at the highest level of the old Reunion Arena – basically the worst tickets in the arena, but then they were only two dollars apiece. Parking cost me more than the tickets did. We would smuggle our soft drinks in (obviously, back in the days before you had to walk through a scanner or have your pockets searched). But for two dollars I got to watch Magic Johnson, Larry Bird, Moses Malone, Michael Jordan, Julius Erving, and Isaiah Thomas – all the stars of that era. I got to see Kareem sink skyhooks. Best-spent two dollars of my life. As business got better my tickets got better, until I finally have some of the best tickets (at least for the price) at the American Airlines Center. One of my few indulgences. I have ticket partners, so I only go to about 10 to 12 games a year, but I really enjoy them. And no, I don’t know Mark Cuban. Well, I have met him three or four times when we used to work out at the same gym. He is basically a gym rat like me. He trains pretty hard and is intense as he prowls the gym floor. He has struck me as a nice guy when we’ve talked. He has randomly sent me a few emails over the years, commenting about things or thanking me for saying something nice about the Mavericks. He may be the most intense owner in the NBA, which I think is a good thing. He runs a smart business, but I really believe he is more focused on winning than on making money on his basketball team. Time to hit the send button. You have a great week, and hopefully this week I’ll make my deadline and have the letter to you on time this weekend. What’s the point of free-trade deals if governments can wipe out the benefits with monetary maneuvers? Passionate defenders of the “global rules-based trading system” should be wary of thinking their views are more informed than President Trump’s. He has been branded a protectionist and thus many conclude he is incapable of exercising world leadership. Meanwhile, those who embrace the virtues of global free trade disregard the fact that the “rules” are not working for many American workers and companies. Certainly the rules regarding international exchange-rate arrangements are not working. Monetary integrity was the key to making Bretton Woods institutions work when they were created after World War II to prevent future breakdowns in world order due to trade. The international monetary system, devised in 1944, was based on fixed exchange rates linked to a gold-convertible dollar. No such system exists today. And no real leader can aspire to champion both the logic and the morality of free trade without confronting the practice that undermines both: currency manipulation. When governments manipulate exchange rates to affect currency markets, they undermine the honest efforts of countries that wish to compete fairly in the global marketplace. Supply and demand are distorted by artificial prices conveyed through contrived exchange rates. Businesses fail as legitimately earned profits become currency losses. In other words, central banks provide useful cover for currency manipulation. Japan’s answer to the charge that it manipulates its currency for trade purposes is that movements in the exchange rate are driven by monetary policy aimed at domestic inflation and employment objectives. But there’s no denying that one of the primary “arrows” of Japan’s economic strategy under Prime Minister Shinzo Abe, starting in late 2012, was to use radical quantitative easing to boost the “competitiveness” of Japan’s exports. Over the next three years, the yen fell against the U.S. dollar by some 40%. Last April, U.S. Treasury Secretary Jacob Lew cautioned Japan against using currency depreciation to gain a trade advantage and he placed the country on a “monitoring list” of potential currency manipulators. But in response, Japanese Finance Minister Taro Aso threatened to raise the bar, saying he was “prepared to undertake intervention” in the foreign-exchange market. 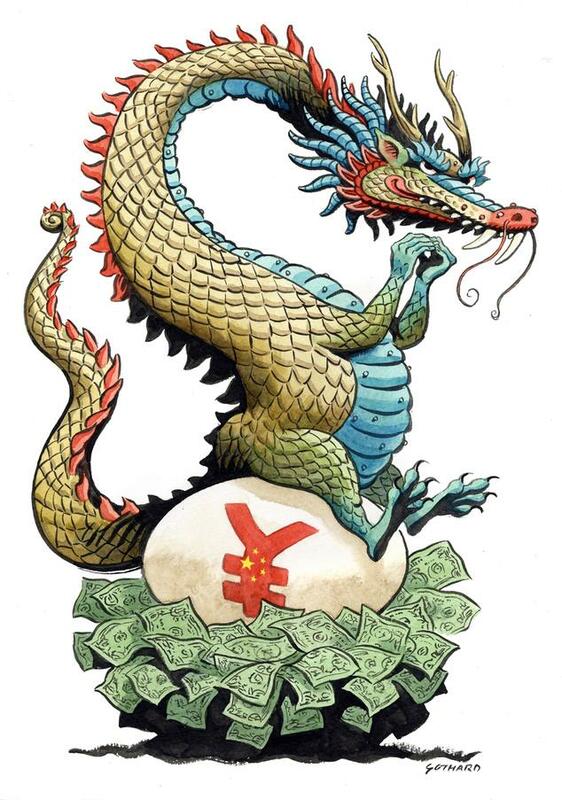 China has long been intervening directly in the foreign-exchange market to manipulate the value of its currency. The People’s Bank of China announces a daily midpoint for the acceptable exchange rate between the yuan and the dollar, and then does not allow its currency to move more than 2% from the target price. When the value of the yuan starts to edge higher than the desired exchange rate, China’s government buys dollars to push it back down. When the yuan starts to drift lower than the desired rate, it sells off dollar reserves to buy back its own currency. Whether China is propping up exchange rates or holding them down, manipulation is manipulation and should not be overlooked. To be intellectually consistent, one must acknowledge that the distortions induced by government intervention in the foreign-exchange market affect both trade and capital flows. A country that props up the value of its currency against the dollar may have strategic goals for investing in U.S. assets. The notion that free trade should be based on stable exchange rates so that goods and capital flow in accordance with free-market principles has been abandoned by technocrat elitists who simultaneously extol the benefits of globalization. But it makes no sense to devote hundreds of pages to carefully constructed trade terms that ratchet down tariffs a few percentage points when currency movements can wipe them out in a matter of days. Mr. Trump is taking the right first step to address this issue by questioning why there aren’t adequate rules in place to keep countries from manipulating their exchange rates. The next step is to establish a universal set of rules based on monetary sovereignty and discipline that would allow nations to voluntarily participate in a trade agreement that did not permit them to undermine true competition by manipulating exchange rates. Mr. Trump’s penchant for identifying core problems and taking bold actions to resolve them is encouraging. He would do well to take the next step for the sake of free trade and to establish a system that ensures stable exchange rates. —Ms. Shelton, an economist, is the author of “Money Meltdown: Restoring Order to the Global Currency System” (Free Press, 1994). She served as an economic adviser to the Trump transition team. Come for the chaos, stay for the consequences. The Flynn debacle is just the tip of the iceberg. Stephen Miller, top White House policy advisor and creepy, unblinking throwback to totalitarian propaganda ministries of old, bragged that Donald Trump has gotten more done in his first three weeks than some presidents do in their entire terms of office. Seemingly allergic to facts as this champion of unsubstantiated scare stories is — from those about refugees to the myths of voter fraud — he may be on to something. Trump is already breaking records. Disgraced former National Security Advisor Michael Flynn’s 24 days in office is by almost half a year the shortest tenure of any national security advisor in history. The scandal that brought Flynn down is almost certainly the earliest of real consequence to hit a fledgling presidency. From Flynn’s apparently illegal communications with the Russian government to Trump’s conducting of what should have been secret business in the middle of a dinner party at his Florida club, no White House has ever shown such contempt for the norms of operational security. Trump’s approval rating is the lowest for a new president in the modern era. His disregard for the Constitution has not only gotten him in trouble with the court system earlier than any president in recent memory, but it quite likely gives him the record for being the earliest serial violator of his oath of office ever. No president has ever been enshrouded by anything remotely like the web of conflicts of interest that envelops Trump, who has made being above the law a foundational principle of his presidency. He has done more to shake the confidence and earn the opprobrium of America’s most important allies — from the U.K. to EU and Mexican leaders to Australia — than any president since the United States became a world power. And as Miller barked out on last Sunday’s morning news shows, this president is just getting started. Attention must be paid. The problem with “achieving” so much so quickly is that the mind begins to numb at the litany of outrages. The above list hardly begins to describe it; it really is only zeroing in on some of the most outrageous or unprecedented of Trump’s misdeeds and missteps. Even the story of Flynn’s Logan Act-violating contacts with the Kremlin, and his subsequent lies about it to the media and to the vice president, was not the only tale of problems to come out of the National Security Council (NSC). The vital nerve center of the government was in chaos. It was having trouble hiring quality people. One top appointee to a key deputy slot, Monica Crowley, had her nomination pulled because of a past history of plagiarism. K.T. McFarland, another deputy appointee who, like Crowley, hailed from that training ground for statesmen Fox News, took office only to hold just one deputies meeting in the first two weeks of the administration and, according to one former NSC staffer, surprised her colleagues by saying, “Hi, I’m from television — let’s keep all the comments to under two minutes.” (According to the New York Times, she is expected to soon follow Flynn in resigning.) Bannon got a permanent seat on the NSC, and the chairman of the Joint Chiefs of Staff and the director of national intelligence did not. Senior directors of the NSC were not invited to Oval Office meetings for calls with foreign leaders as is traditionally the case, resulting in a lack of proper briefing for the president. The president, however, did not seem to care for proper briefings, avoiding or truncating intelligence presentations on which presidents regularly depend. For that matter, he also allowed Flynn to cook up an alternative daily brief to the one traditionally supplied by the intelligence community. And the word went out to NSC staffers that briefing documents should be only one page long and contain lots of pictures and charts for a president famously averse to actually reading and learning about the substantive side of his job. A New York Times report recently revealed an NSC in chaos in which the driving intellectual ideas came from early morning tweets from the president’s private Twitter account (his use of his own phone and Twitter account being another reminder that security is not a priority for this commander in chief). Since none of those tweets was the result of a policy process, the staff — itself a patchwork of Barack Obama holdovers, Flynn military contacts, and second- and third-stringers from the GOP policy bench (due to the alienation of the Republican policy community from and by the Trump administration leadership) — was left scrambling to adapt to the president’s off-the-cuff ramblings. Of course, we also saw the very serious consequences that come from having no policy process: the chaos surrounding the implementation of the president’s travel ban; a federal court putting a hold on that ban; the conflicting stories and framings of the ban from within the administration; and in other areas like the damage done to U.S.-Mexico relations by a presidential tweet (and presidential bad policy judgment) or that done to the U.S.-Australia relationship by a president who didn’t know his brief, anything about diplomacy, or have much of a grip on history or long-term U.S. interests. Beyond that, there were daily shocks on the government ethics front from the president’s ongoing refusal to disclose his tax returns as all his modern predecessors had done, his flouting of standards against nepotism, his refusal to divest his corporate interests, and his almost certain repeated violations of both aspects of the emoluments clause of the Constitution prohibiting him to profit from either foreign government payments or any remuneration from the U.S. government other than his salary. His unorthodox living arrangement with his wife has created security costs that will surpass each year the level of funding required by, say, the National Endowment for the Arts, which the president allegedly seeks to defund. His sons travel the world doing business that benefits their dad and enriches their family at large while also racking up big burdens to the U.S. taxpayer in the form of security costs. (Not having paid taxes in roughly two decades, this is an area in which the president may not be able to relate to the outrage of his constituents.) Foreign business interests of the president have already resulted in apparent impact on conversations with leaders from the Philippines to Taiwan to Russia (more on that in a moment). He continues to own a hotel that leases its space from the U.S. government in apparent direct violation of his lease. And, again, the list of such outrages — from the participation of his children in official government meetings to holding official meetings with foreign leaders like Japanese Prime Minister Shinzo Abe at Trump’s private club in Florida, no doubt benefiting the club in myriad ways (and even resulting in using the Japanese prime minister as a prop to amuse guests at a Mar-a-Lago wedding) — is too long to contain in this article. Where do we direct our outrage when this is the record of just three weeks? Where do we even begin? How do we even remember what to be outraged about? When there is a new scandal every six hours or so, it is hard to remember what happened four scandals ago (what we used to call “yesterday”). That is the fog of Trump. Like the fog of war, it makes decision-making difficult and makes apprehending the import of what is happening exceptionally challenging if not impossible to the average observer. (It’s even a challenge to commentators who, as one prominent columnist for the Washington Post recently confessed to me, have to keep spiking pieces they are working on because “some new story breaks and has me headed off in another direction.”) Is this all part of a great plan? That seems unlikely because folks like Miller and Flynn and Spicer and Conway and Priebus seem largely clueless and often deeply incompetent. But elements of this kind of shock-and-awe strategy may be cooked up and seen as clever by the likes of Bannon (though my guess is we often give him too much credit — in my experience, people who hold ridiculous and indefensible views often do so because they are not smart enough to know better). In any event, intentional or not, Trump has actually managed to avoid dealing with the consequences of his catastrophic first month in office (the worst since William Henry Harrison, who caught pneumonia at his inaugural and died a month later) to a remarkable degree. Some of that is due to the complete failure to act of one of the government’s most important checks on such abuses — the U.S. Congress. Like others who support Trump when they can clearly see the mess he is making daily, congressional leaders like Mitch McConnell and Paul Ryan have repeatedly put party before country or, just as bad, the prospect of advancing their own long-held legislative goals ahead of things like national security, morality, American values, and the well-being of those they are supposed to be serving. They have all sold out their constituents (and perhaps their souls) for the low price of political revenge or a brief ideological high. Their inaction in the face of evidence of massive wrongdoing has made them collaborators with Trump or, as the law would have it, accessories or co-conspirators (see McConnell’s reported statements that he would block the investigation into the Russian hack of the U.S. election for political purposes, thus enabling a Russian plan that intelligence data suggested was underway to continue). This brings us back to the scandal that brought down the hapless and arrogant Flynn. If the White House thinks that throwing Flynn under the bus will relieve it of further scrutiny of Kremlingate, we had all better hope it is sadly mistaken. In any other world, at any other time, a scandal that tied the president of the United States and his closest associates to one of America’s leading adversaries in the wake of action by that adversary that likely had a direct impact on the results of a U.S. election and subsequently resulted in a complete reversal of long-standing U.S. policy toward that adversary, would not just dominate U.S. political debate; it would obliterate discussion of anything else until it was fully resolved. Not only would it — but it should. There has never been a scandal like it in American history. For that reason, we cannot and must not let the fog of Trump get the better of us. Nor can we let it derail necessary debate or the checks demanded by law on the other inchoate yet shocking outrages of the Trump Era (known otherwise as the past few weeks). We can’t let the number, scope, diversity, or complexity of the abuses of public trust currently underway serve as a defense for the perpetrators of those abuses, whether the fog is intentional or not. We must flag every wrong, challenge every lie, and demand action where the law and our values demand it. Nothing less than the future of American leadership, security, and credibility demands it. It’s tempting to see surging U.S. stock prices and business confidence as all coming in response to President Donald Trump’s election. But the upswing is global: In Europe, Japan, China and elsewhere, business surveys and markets have turned markedly more optimistic. This is partly because investors hope that any fiscal stimulus Mr. Trump enacts will spill over to other countries. Yet a confluence of other factors is also at work: Oil prices are on an upswing thanks to production cuts by the Organization of the Petroleum Exporting Countries. Chinese and European economic activity picked up in the second half of last year. And, economically speaking, populism has so far been a wet firecracker. A few weeks after Mr. Trump’s election, OPEC agreed to cut production and its member countries have largely abided by their pledges. Oil prices, which fell below $30 a barrel a year ago, have remained above $50 since the agreement. 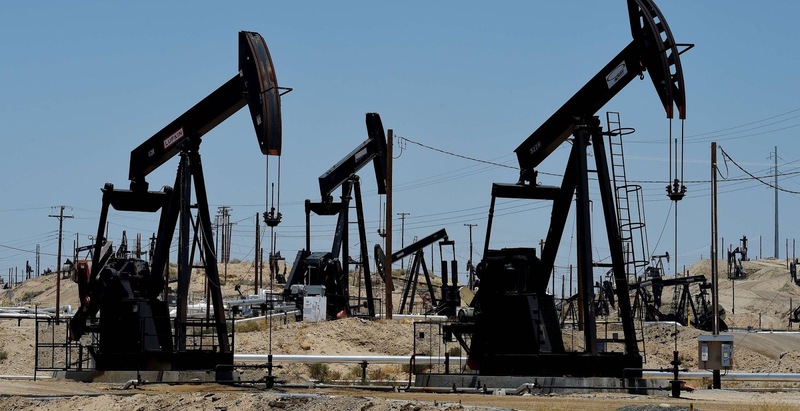 As a result, the number of oil and gas drilling rigs operating in the U.S. has jumped 80% since June, according to Baker Hughes, an oil field services company. Oil and gas field machinery production is up 10% since August. Firmer energy prices have pushed actual and expected inflation higher. U.S. inflation hit a five-year high in January. Ordinarily that’s bad, but it is now welcomed by central bankers who worried that too-low inflation can easily become destructive deflation. In mid-July bond markets expected inflation in five to 10 years’ time to average 1.2% in the U.S., 1.4% in the eurozone, and 0.1% in Japan. Those figures have since jumped roughly half a percentage point. Mohamed El-Erian, an adviser to the German insurance company Allianz, thinks the OPEC agreement will likely keep oil between $50 and $60 a barrel. He said that plus hopes for fiscal stimulus under Mr. Trump and a Federal Reserve continuing to err on the side of raising rates too slowly, rather than too quickly, are why expected inflation has risen. Global growth is also on a firmer footing. A year ago, as China struggled to stem surging capital outflows and a weakening currency, an index of economic activity compiled by IHS Markit slipped into contractionary territory. Then Chinese authorities encouraged banks to crank up lending and clamped new controls on capital outflows. By December, the borrowing boom had driven the index to nearly a four-year high. Evercore ISI projects annual growth in nominal Chinese gross domestic product—economic growth plus inflation—will reach 11% in the current quarter, up from below 7% a year earlier. This growth traditionally has correlated closely with oil and industrial prices. Even Europe shows signs of shaking off its torpor. “Relative to expectations in October, Europe is much stronger both in terms of real business volumes and upside surprises on inflation than the U.S.,” said Jason Thomas, director of economic research at Carlyle Group, a private-equity manager. From 2009 to 2014, all of Europe’s growth came from exports. In 2015, the commodity price plunge battered exports and domestic spending carried growth. “You finally have the domestic economy holding its own at the same time you’ve seen a rebound in orders from emerging markets and the globe more broadly,” he said. The improved outlook for inflation and growth has taken the pressure off central banks in Europe and Japan to lower interest rates further or increase bond buying, and this week Fed Chairwoman Janet Yellen said the bank could raise rates again in coming months. This comes as a relief to commercial banks, whose lending margins have been squeezed by zero to negative rates. Finally, political uncertainty hasn’t been the confidence killer that many feared. Britain’s vote to leave the European Union has damped business investment plans but consumers have shrugged off the uncertainty. Mr. Trump has prioritized rolling back regulations; he has yet to act on his harsh protectionist rhetoric. In meetings with the prime ministers of Japan and Canada this week, Mr. Trump praised economic ties with the two. His administration is exploring alternatives to branding China a currency manipulator. Whether the world can sustain this increased confidence remains to be seen. The global economy is still likely to grow just 3.4% this year, according to J.P. Morgan, better than last year but in line with the sluggish trend of the prior five years. While political uncertainty hasn’t hurt much yet, that could change if the anti-euro National Front wins France’s presidential election this spring. China may owe its growth rebound to a debt bubble that could soon burst. Mr. Trump’s tumultuous presidency could make tax cuts harder to pass while providing ample opportunity for geopolitical shocks. Still, after a year when worst-case scenarios seemed all too plausible, a return to a modest normal is cause for relief.